Premier Holman addresses the Waratahs in Sydney, December 1915. NRS 4481 MS3658P. Premier Holman addressing a crowd at Botanic Gardens Centenary celebrations, June 1916. NRS 4481, MS3931P. This webpage was developed as part of State Archives contribution to History Week 2015. [Fig. 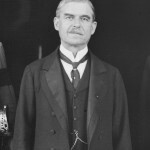 1] Premier William Arthur Holman, January 1919. NRS 4481, ST6651P. [Fig. 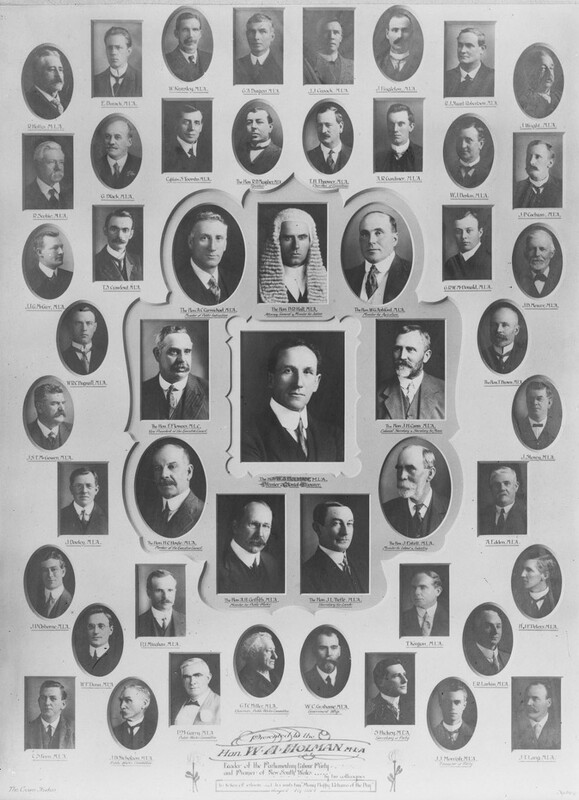 2] Premier Holman and Labor Party Members of the Legislative Assembly, August 1914. NRS 4481, ST13302P. 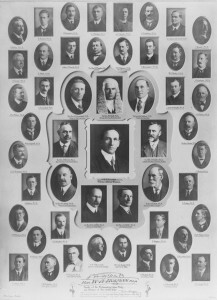 In 1910, the Labor Party, under the leadership of James McGowen, won the election and became the first Labor government in NSW. Holman, already the Deputy Leader, was sworn in as Attorney-General. 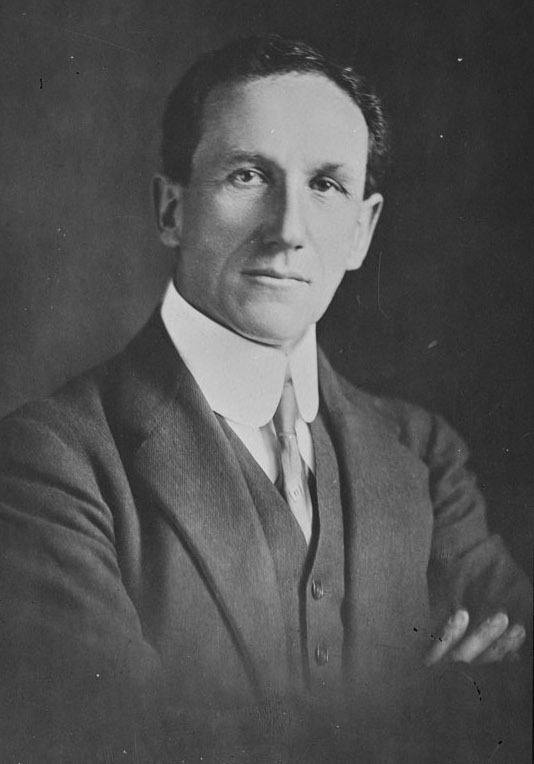 When McGowen was forced to resign, Holman took over as the 19th Premier of New South Wales, on 30 June 1913.[Fig. 2] In a little over a year Australia was at war. [Fig. 3] Letter to PM Cook from Premier Holman, August 1914. NRS 12060 [9/4692 letter 14/4887, p.1]. [Fig. 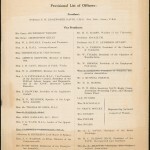 4] List of officers of Universal Service League, NSW Branch. From NRS 12060 [9/4705 letter 15/7337, p.1]. [Fig. 5] Universal Service League Manifesto. From NRS 12060 [9/4705 letter 15/7337, p.2]. 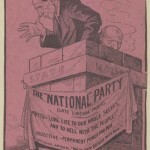 During 1916 Holman had two major clashes with the Political Labor League (from 1918 the Political Labor League became known as the Australian Labor Party, NSW Branch) over conscription. 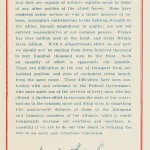 The issue of conscription proved as much of a divisive issue within the ranks of the Labor Party as it did for Australian society in general. 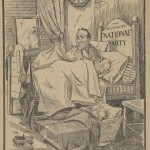 The war and conscription also proved to be a turning point for Holman to leave the Labor Party behind him. 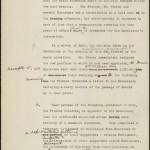 The vote on the conscription resolution took place on a night when Holman, an executive member, was absent from the Conference. (19) The Executive also refused to endorse any Labor candidate that supported conscription, putting the Executive at odds with the Premier and his ministers. [Fig. 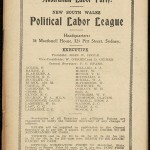 6] Australian Labor Party, NSW Political Labor League executive, April 1916. From NRS 12060 [9/4791 letter B18/2296, p.1]. [Fig. 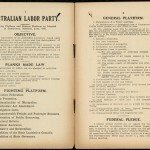 7] Australian Labor Party fighting platform and general platform from June 1915. From NRS 12060 [9/4791 letter B18/2296, pp2-3]. [Fig. 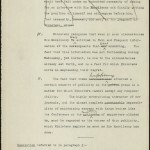 8] PLL Executive conscription resolution, May 1916. From NRS 12172 [4/6252 letter B16/3853, p.2]. 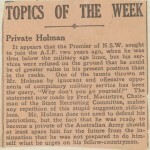 Holman, and most members of his Cabinet, were still willing to back the necessity of conscription. (21) In response, the Political Labor League Executive passed a censure motion against Holman and Holman resigned as Premier to the Labor Caucus. (22) Within one day though, the Executive had backed down and Holman remained on as Premier. [Fig. 9] Governor Gerald Strickland. From NRS 4481 MS5182P. [Fig. 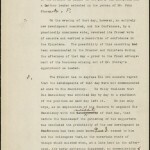 10] Draft minute to Governor Strickland from Premier Holman, May 1916. From NRS 12172 [4/6252, p.1]. [Fig. 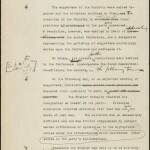 11] Draft minute to Governor Strickland from Premier Holman, May 1916. From NRS 12172 [4/6252, p.2]. [Fig. 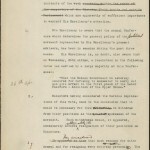 12] Draft minute to Governor Strickland from Premier Holman, May 1916. From NRS 12172 [4/6252, p.3]. [Fig. 13] Draft minute to Governor Strickland from Premier Holman, May 1916. From NRS 12172 [4/6252, p.4]. [Fig. 14] Draft minute to Governor Strickland from Premier Holman, May 1916. From NRS 12172 [4/6252, p.5]. This confrontation earned Holman the ire of the NSW Governor, Gerald Strickland.[Fig. 9] Technically ministers could only resign to the governor. Strickland, in a letter to Andrew Bonar Law, the British Colonial Secretary,states that he “was not prepared to appear to acquiesce in a real or alleged change in the constitutional procedure as regards the resignation of Ministers.” (23) Holman apologised to the Governor and although appeased, their relationship never fully recovered.[Fig. 10-14] Holman’s superb political manoeuvring to stay in power had left him offside with the Labor Party and the Governor. In the next six months this situation worsened. 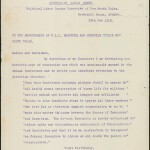 The second more serious fallout between Holman and the Political Labor League occurred in the wake of the conscription plebiscite. When Prime Minister WM Hughes returned from a tour of the Western Front in August 1916, he announced plans for a plebiscite (non-binding referendum) on the conscription issue to be held on 28 October 1916. Holman and Hughes campaigned for a ‘Yes’ vote in the plebiscite, which brought both men into conflict with the Labor Party Executives. [Fig. 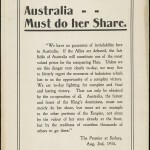 15] Australia must do her share recruitment flyer. From NRS 12060 [9/4718 letter A16/2303, p.1]. [Fig. 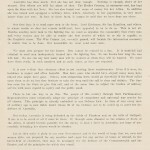 16] Holman’s message in the Australian Natives’ Association of NSW flyer, 1915. From NRS 12060 [9/4705 letter 15/7546, p.1]. [Fig. 17] Recruitment cartoon from the Australian Natives’ Association of NSW flyer, 1915. From NRS 12060 [9/4705 letter 15/7546, p.2]. [Fig. 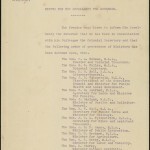 18] Order of precedence of ministers in new Nationalist coalition, November 1916. From NRS 4541 [7/1670 letter 16/806]. [Fig. 19] Holman cartoon, from The Worker, 9 November 1916. 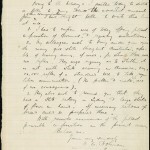 From NRS 12060 [9/4754 letter B17/804]. [Fig. 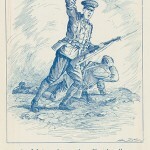 20] Misalliance cartoon featuring Holman, Fuller and Beeby, 16 November 1916. NRS 12060 [9/4754 B17/804, The Worker]. You must meet conscription with conscription or you must perish in the struggle. The 1917 plebiscite was defeated, just as in the previous year. Holman maintained power but increasingly his government was ineffectual and personal attacks [Fig. 21] on Holman increased. (36) In the 1920 election Holman was defeated and retired from NSW politics. Holman was the Premier of New South Wales for six years and nine months, spanning the entire period of World War I. He was, in fact, the only state leader to remain in office during the war. His legacy though, has been coloured by the events that occurred in 1916. Holman, a supporter of conscription for overseas service, left behind his Labor roots and formed a new Nationalist government. 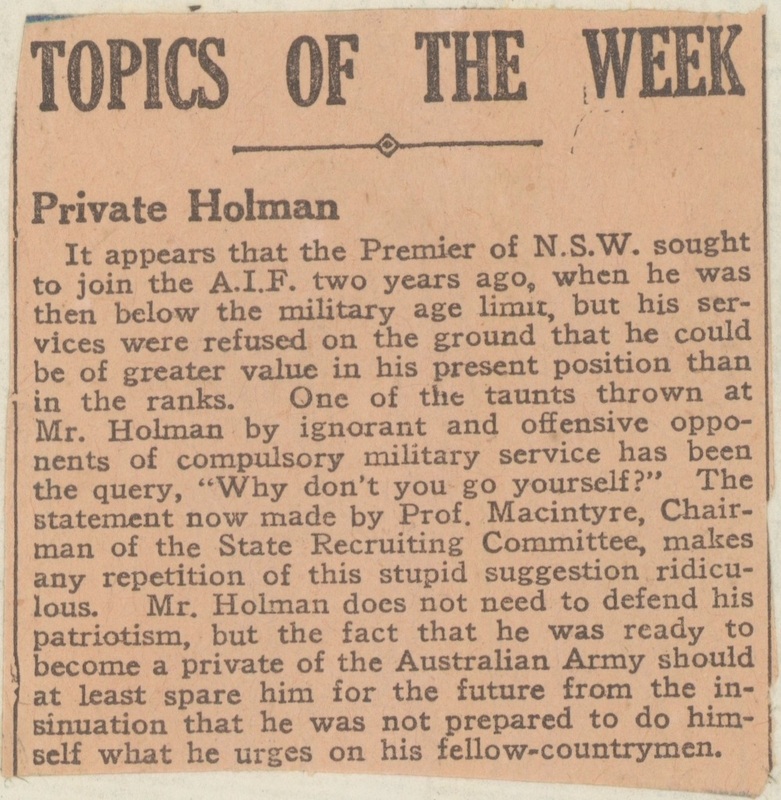 Holman was forever caught between the Labor Party, who viewed him as a traitor, and the Nationalists, who didn’t quite trust him or his background.